If you want to buy cheap seville shirt for 2018-19 season, buy it here in cheap-football.com , Check our exclusive range of seville Football Shirts / Soccer Jerseys and Kits for adults and children at amazing prices. Get the cheap seville jersey shirts, soccer kits with wholesale price, Free Shipping Worldwide! Sevilla is based in Seville, the capital and largest city of the autonomous community of Andalusia. 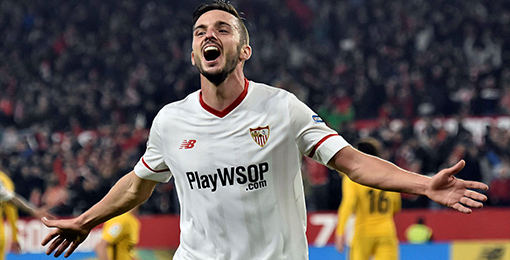 Sevilla is one of the teams that play in Spain’s top flight, La Liga. The club was formed on 25 January 1890,Sevilla is also the most successful club in Andalusia, winning a national league title in 1945–46, five Spanish Cups (1935, 1939, 1948, 2007 and 2010), one Spanish Super Cup (2007), a record five UEFA Cups/UEFA Europa Leagues (2006, 2007, 2014, 2015 and 2016) and the 2006 UEFA Super Cup. They were also designated by the International Federation of Football History and Statistics as the World's best club in 2006 and 2007, thus being the first club to achieve this distinction in two consecutive years. Sevilla FC's main rivalry is with their cross-city rivals Real Betis de Sevilla. Matches between the two are referred to as Seville derby.